This list of easy miniature needlework charts contains small projects suitable for a dolls house, or for use as repeated patterns or section larger needlework designs. The charts are in color, with lists of DMC cotton colors used. Various canvas counts are used, from 18 HPI to 42HPI Silk Gauze. Cross Stitch Calculator will determine the finished size of a petitepoint or cross stitch based on the fabric thread count and number of stitches. Miniature twisted cord made from three colors of embroidery thread trims a dollhouse scale cushion. Photo ©2008 Lesley Shepherd, Licensed to About.com Inc. These traditional designs can be used for dolls house cushions, upholstery, firescreens or as petit point subjects for brooches or framed needlework. All can be worked in a variety of sizes and scales. Check the dimensions of the design and work it on a fabric suitable for your scale purpose. Traditional Rose and Lily of the Valley Bouquet Tied with Ribbon - 33 x 36 stitches. Vintage Floral Design - 49 x 50 stitches (design area only). 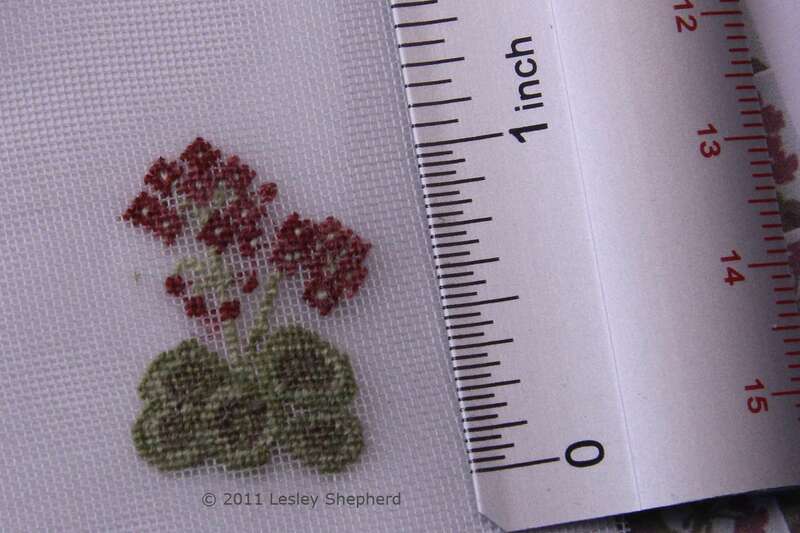 Petite point or needlepoint miniature example of the rambling rose design suitable for dolls house scale. This design can also be working in cross stitch. Photo ©2008 Lesley Shepherd, Licensed to About.com Inc. These floral designs have been created especially for dolls house scale miniatures, but can be used for all types of miniature needlework. Miniature lamb worked in petitpoint and French knots on lavender linen. This little lamb is suitable for a dolls house cushion. Photo copyright 2008 Lesley Shepherd, Licensed to About.com Inc.
All of these charts can be worked in needlepoint, petitpoint or cross stitch. Most are close to 40 stitches square, and make up into dollhouse miniature pillows stitched on 32 count linen. These designs co-ordinate with the printable nursery wallpapers. Miniature Lamb Needlework chart for needlepoint, cross stitch, or a combination with French knots. Four Petal Flower Cross Stitch Chart. This two inch needlework Jack o lantern or pumpkin pattern will make a cross stitch or petitpoint cushion for a fashion doll. Photo ©2008 Lesley Shepherd, Licensed to About.com Inc. These seasonal designs are small enough to work on dollhouse cushions or other accessories. A finished petite point Christmas stocking in 1:12 scale shown hanging from the hand of a dolls house doll. Photo copyright 2010 Lesley Shepherd, Licensed to About.com Inc. These simple designs for miniature Christmas stockings have three traditional motifs. As shown, the stockings are worked over 42 HPI silk gauze, to make them the correct scale for a 1:12 scale dolls house. Worked on larger canvas, the stockings can be used for Christmas tree decorations or to decorate packages. All the designs are suitable for a beginner.